Splitboarding is growing in popularity among serious skiers and snowboarders alike. This unique sport combines the utility of skis with the fun of snowboarding – but it shouldn’t be taken lightly. Splitboarding is very physically demanding. If you’re not prepared for your first splitboarding experience, you may have a seriously difficult time enjoying this unique, backcountry snowsport. But don’t worry. We’re here with a breakdown of splitboarding, and with some basic advice on how you should prepare for your first splitboarding experience. Splitboards are pretty simple to understand. They’re specialized snowboards that use unique hardware that allows them to be split in half, and used as approach skis in the backcountry. 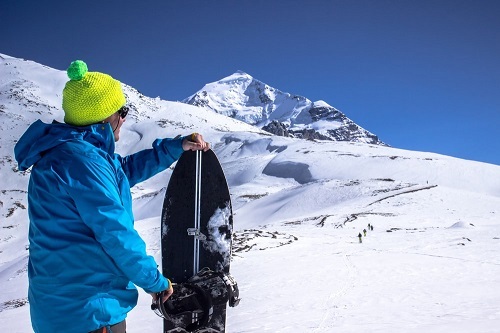 Splitboards have both traditional snowboarding boot bindings, as well as ski bindings on each “side” of the board. In the past, snowboarders usually had to hike through snow in ungroomed, backcountry ski slopes. This requires a huge amount of energy, and is very slow and inconvenient. Splitboarding allows snowboarders to use their snowboard like a pair of skis when traveling through the backcountry, then snap it back together when it’s time to descend the slope. This makes it easier (and more fun) to explore ungroomed trails and backcountry ski areas. How Should I Prepare For Splitboarding? Splitboarding is very physically demanding – and to have fun while splitboarding, you’ll need a baseline level of physical fitness. Here are a few of the ways you can physically prepare your body for splitboarding. HIIT Training (Intervals) – Interval training is very good for the development of anaerobic muscle fibers, and for strengthening the heart and circulatory system. Because splitboarding often takes place at high altitudes, and requires bursts of controlled power, HIIT training is a wonderful way to prepare your body, and ensure that you are ready for this one-of-a-kind snowsport. Windsprints are a great method of interval training, and climbing stairs is another great way to build up your strength and cardiovascular system. Cardio – Traditional cardio, such as running, cycling, or using an elliptical, is also a good idea when you prepare yourself for splitboarding. Cardio helps boost your aerobic stamina, which is critical when you’re on a long, uphill approach to a ski run in the backcountry. Strength Training – Cross-country skiing, which is pretty much what you’re doing while splitboarding, takes a lot of strength – especially from your legs. Try to develop your quadriceps and glutes with exercises like squats and lunges, to ensure that you’ll have the strength to climb a mountain – and descend down the other side! Altitude Training – If at all possible, it’s a good idea to do some high-altitude training. If you can do HIIT or cardio at 6,000+ feet above sea level, you’ll be able to maximize your body’s ability to deal with high elevation. If you’re not properly acclimated to the altitude, you could get altitude sickness when splitboarding – though this is rare for healthy, properly trained adults. Snowshoeing/cross-country Skiing – If you are just taking up splitboarding, and have never done any cross-country skiing before, you’ll want to get a feel for it before you head up the mountain. You can grab your splitboard and head to the nearest snowy area, and practice cross-country skiing on both flat ground and uphill. If you don’t have a splitboard, or are planning to rent one, you can train using snowshoeing as an alternative. The motion is not quite the same – so you will still have to get used to cross-country skiing on the mountain – but snowshoeing utilizes many similar muscle groups, and can help you get a baseline understanding of how you’ll feel while on your approach skis. Snowboarding – This probably doesn’t’ come as a surprise! To get ready for a backcountry splitboarding experience, you should snowboard as much as possible – especially if you usually stay on “groomers” and avoid deep powder. Splitboarding in the backcountry can be dangerous – and unless you’re already an intermediate-expert snowboarder, you’re putting yourself at risk. Hit that powder, train up, and get ready to splitboard! Be Ready For The Rigors Of Splitboarding – Follow This Guide! Splitboarding is a great innovation for snowboarders who are interested in getting into that beautiful backcountry powder – but it’s not without its challenges. So follow this guide and our tips, and get ready for your first splitboarding session. If you listen to what we have to say, and take things easy, you’re sure to have a blast. This entry was posted in Winter Sports and tagged Splitboarding. Bookmark the permalink.